In my last article I described how to import Contacts from your Goggle Account. Now I will describe how to bring those (and also every other) contacts to baikal and how to setup synchronisation between Thunderbird and Baikal. 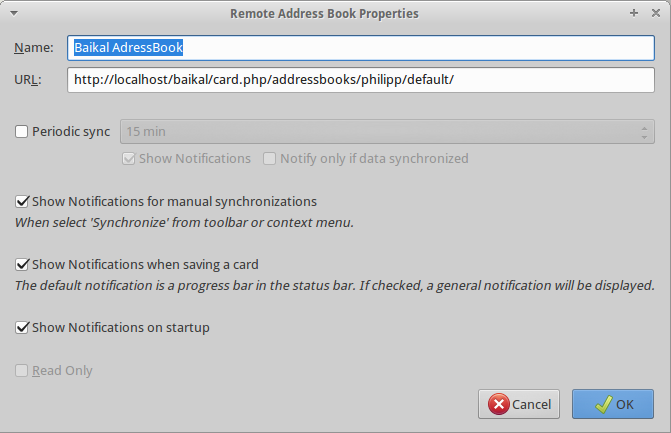 After that, we are able to create a Remote-Address Book in Thunderbird. Here you can see my settings for that address book. The value „philipp“ is the ID of my Baikal-user, „default“ is the token-id of my address book in baikal (see related Baikal article). Now you can move your contacts from your Google Addressbook to your Baikal Address book via drag&drop (or via copy&paste). After you have moved/copied the contacts to the baikal address book you should run the sync-command to push the contacts to your baikal-server (right-click on your baikal address book and hit „Synchronize“). In my case, all of my 323 Google Contacts were stored in the database. Now I can sync every device and tool (Thunderbird, Android, etc.) with my baikal address book. For my project to move all my contacts to Baikal (see related articles) it is necessary to bring my google contacts to Thunderbirds Addressbook. Create a new Address Book which should be used to import the Google Contacts. Also configure your google-Accont. If you are using app-passowords, you have to generate one in your google account. I have set the Sync-Type to Read-Only, because I just want to receive the contacts, but not to modify them (also it is more secure if we do some mistakes). 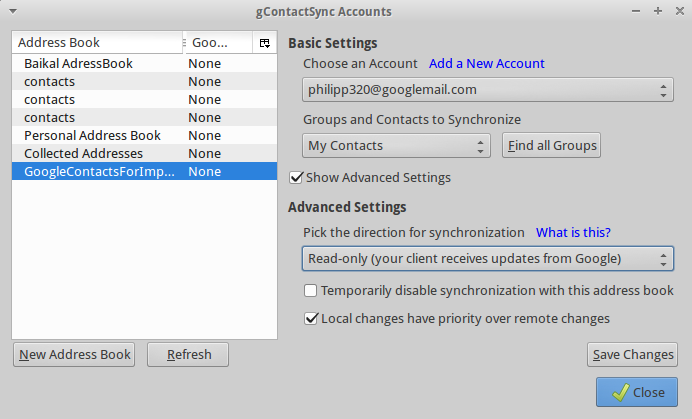 Now you can close the window and click on „gcontactSync“ -> „Sync“ to receive the contacts. They should now be available in your GoogleContacts Addressbook.